The following clinical guideline on the use of enzyme detergent for cleaning intraocular instruments is being jointly released by ASCRS, AAO, and OOSS. 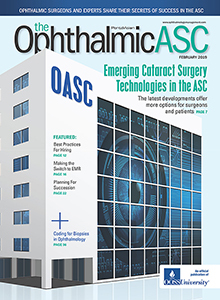 Because of the risk of TASS, many ASCs do not use enzyme detergent to clean intraocular instruments. Because some regulatory agencies are citing this as a deficiency, this guideline is meant to explain the risk of TASS, and to support the reasons why some facilities elect not to use enzyme detergent because of this risk.